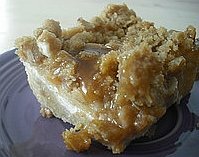 If you have a few Granny Smith apples, you must make these homemade caramel apple bars. They are downright sinful. Friends and family will flip for these - so make a double batch. In a medium bowl, combine flour and brown sugar. Cut in butter with a pastry blender until mixture is crumbly. Press evenly into a 13-by-9-by-2 inch baking pan lined with heavy-duty aluminum foil. Bake 15 minutes or until lightly browned. In a small bowl, combine all ingredients. This recipe is from PaulaDeen.com.